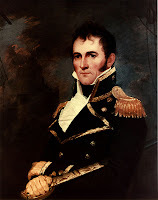 As Captain Porter was a great favourite at the city of Washington, Mr. Clark, who was patronised by all the great men there, could do no less than insert in his book any little tale which the former might wish to see recorded in the naval history of his country. It did not perhaps occur to Mr. Clark, that ships usually carry log-books, in which are entered every day's proceedings, with the latitude, longitude, &c.; and that these can be referred to, in case the false assertions of any historian, or paragraph-writer, or American captain, may be worth the trouble of disproving. Considering what a formidable man Captain Porter was, nothing less than the Acasta "of 50 guns," and Ringdove, "of 22," could be sent out to cruise for the Essex. Unfortunately for the fame of the captain of the Essex, on the 30th of August, 1812, the day mentioned, the Acasta was cruising in the latitude of 43° north; longitude 65' 16' west; and the Ringdove, whose force, by-the-by, was only 18 guns, was lying at an anchor in a harbour of the island of St:-Thomas. It was certainly very modest of Captain Porter, to "think it not unlikely," that one of the finest 18-pounder frigates in the British navy, accompanied too by a sloop of war, would be sent out to "cruise for the Essex." The fact is, the ship, which Captain Porter fell in with, was the 18-gun sloop Rattler, Captain Alexander Gordon; and who, we believe, not considering himself a match for the American frigate, rather avoided than sought an engagement with her. * Clark's Naval history of the United States, vol. i. p. 180.